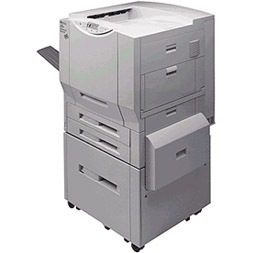 The entire office relies on your HP Color LaserJet 8550dn printer, and for good reason. It’s got an impressive print speed of up to 24 ppm (pages per minute), optional double-sided print capabilities, and a media capacity of up to 3,100 sheets, making this device perfect for any large, fast-paced office. HP C4149A toner cartridges provide you with a very high page yield, too, making it easy for your entire office to keep on top of any task. You need good toner for your printer in order to produce quality work, but the price of original equipment manufacturer (OEM) cartridges can be inordinately high, making professional-quality print work unobtainable for some consumers and business owners. Fortunately, you’ve got another option; you can get professional quality for a bargain price at 1ink.com. Finding affordable toner for HP Color LaserJet 8550dn printers can be challenging, but 1ink.com makes it easy. Our remanufactured toner cartridges install just like an OEM unit and give you the same performance and the same results. There’s never any risk to ordering from 1ink.com – you’ll get the quality work you need for less!